The ScienceDirect API services as described in the IR/CRIS/VIVO use case, are available to all IRs free of charge upon acceptance of a click-through agreement when registering for an API key. If your institution cannot accept a click-through agreement, you can contact your local sales representative for a regular ScienceDirect amendment or an Agreement for non-ScienceDirect customers. Are you interested in implementing ScienceDirect API services or want to learn more? Institutions using DSpace can additionally benefit from Elsevier plug-ins for DSpace, which can be downloaded here. These plug-ins facilitate optimal integration of ScienceDirect APIs within your repository. "Automate your Elsevier content submissions to DSpace repositories" and learn how free ScienceDirect API services enhance Institutional repositories. With the integration of the ScienceDirect API services in the new Pure Portal, we have made it easier for institutions using Elsevier’s Pure Portal to access the best available versions of articles by your institution’s authors, as well as to see embargo end dates and licenses for author manuscripts accepted for publication in Elsevier journals. Pure aggregates your organization's research information from numerous internal and external sources, and ensures the data that drives your strategic decisions is trusted, comprehensive and accessible in real time. 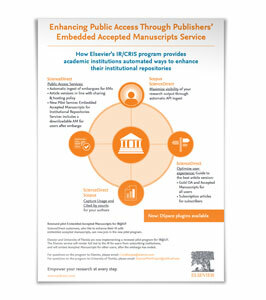 We invite you, as a ScienceDirect customer, to join our renewed public access pilot service which will embed author accepted manuscripts into your institutional repository. This pilot is an extension of our existing ScienceDirect API Services Program. Our APIs will link your IR users who are not affiliated with an institution subscribed to ScienceDirect, to an embedded author accepted manuscript. The service will be rendered after the relevant article’s embargo period has ended. The user can use a download button to download a copy of the article.